This post was written in 2005 to be published in The Screaming Mandrake - A Victorian magazine publication of the Pagan Alliance (Issue 3, Spring 2005). 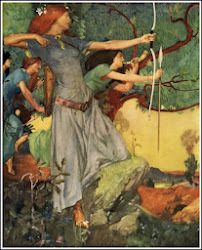 It was also posted on the Mount Franklin Beltane blog in March 2011. 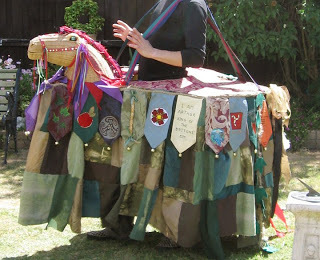 I have decided to make a hobby horse, and I want to make it in time for the Mt Franklin Beltane Gathering of October 2005. That gives me a goal and time limit. 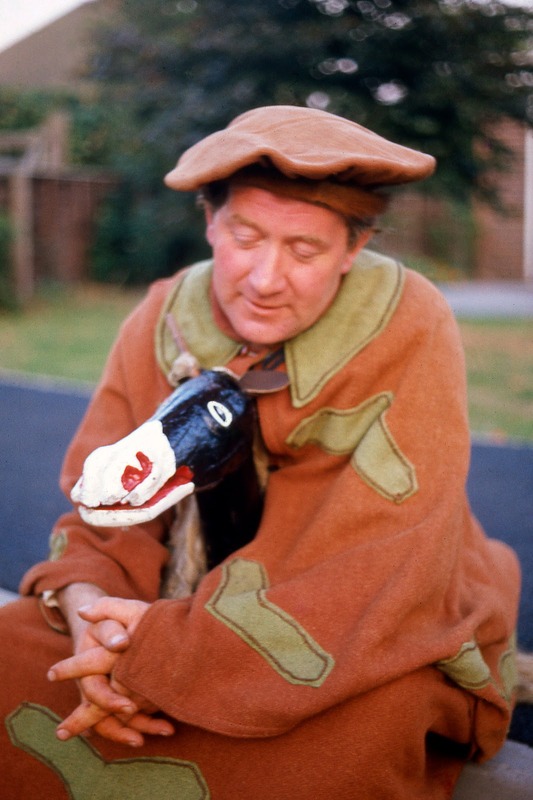 I recall the days of my youth, when a hobby horse was plastic or stuffed vinyl horse head on a stick, with reins and wheels. Little did I know then, that this was a major festival item for many British and European celebrations, and that often they were large and highly decorated, sometimes appearing during the longest summer days or the shortest winter days and often ‘dying’ at the end of the festival, only to wait to be revived in a years’ time. 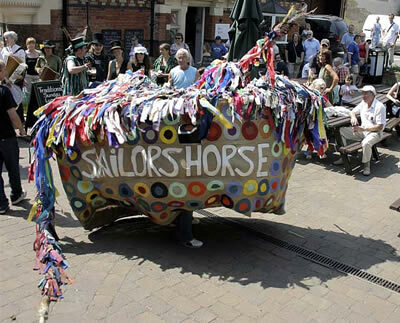 Today the most popular hobby horse festival I know, is the May Day festivities of Padstow, on coastal Cornwall, where they have a black hobby horse called the ‘Oss’. I’m calling mine the ‘Oss’ these days. February 2005 – We receive a gift of a wicker horse head from a friend Paul. The head has no ears and has marble eyes, although one eye has been pulled out and the wicker eye socket damaged. It already has a red vinyl bridal. I plan to do some research to find out about these hobby horses. The books on my shelf tell of fantastic legends and customs of the horse in fertility festivals and its importance in Celtic and other mythologies. Alexei Kondratiev's book The Apple Branch – A path to Celtic Ritual has fine information about the Mari Llwyd and the darker seasons festivals. June – I go to the National Celtic Festival in Portarlington on long weekend June, with my old super 8 camera to catch footage of the Padstow Obby Oss that is rumoured to be there. We see no sign of it. My friends Wendy and Mark and I often ask organisers, where is the Oss? Most of them have no idea what an Oss is. We are horrified. July and Aug – Designs of the oss are being drawn up. I decide on a metal ring. Circle or oval? I love the Oss represented in ‘The Wicker man’ film. I ask our blacksmith friend Owen to make a ring. I decide on a size, but think it may be too big. I wanted a circle but am not fussed if its an oval. And maybe a ring for the head to sit on. Sept – I buy a large marble and find it is a little bigger than the eye already there. I still add it to the head and put air-drying clay over the eyelid. I put an identical layer of clay over the other eye to have matching eyelids. Then I paint it gold. It already seems happier with 2 eyes. I begin to decorate the head. I add a red diamond to his nose, with a gold leafed diamond in the middle of that. I tie all the left over ribbons I had to the red bridal, and added small mirror squares to the bridal too. I am used to seeing it without ears. I planned to add leather ears, but have now decided against it. I add pink and purple raffia to thicken the hair of the horse. Looks like a carnival horse. I want a name for it. I decide to call the Oss ‘Dobbin’ because of my Yorkshire background. A Hobby Horse of Knaresborough, in North Yorkshire, makes his appearance during the Plough Monday Ceremony. 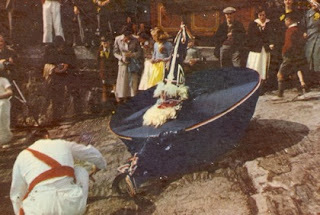 Every January, they pull the plough up the High street in a parade. The horses name is Dobbin. 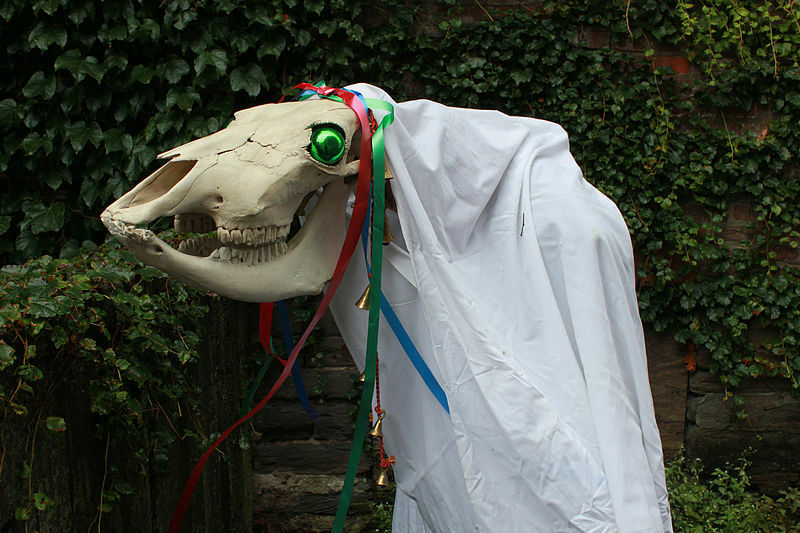 Dobbin is built around the skull of a real horse, placed on a stick with a cloak around it. I am putting flags around the sides, not unlike the Oss in ‘The Wicker Man’. But instead designs of paint, embroidery or material are going to be added to each one – and I will give these flags to friends to all contribute something. I am using beautiful brocade colour samples I got for free from a curtain store. I cut and sew all the flags to identical sizes. I began to paint 4 flags, beginning with the Isle of Man flag, the ‘triskelion’, with the 3 legs, then I paint a flying raven, a St Andrews flag, and an ivy vine. I send some pre-sewn flags to friends to begin their designs. When the ring eventually showed up, I was amazed at its weight, and began to worry. But decided to keep going with it. It was getting close to October and Owen had been working hard and very dedicated. 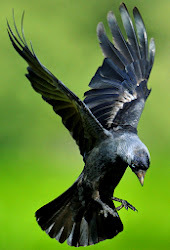 There is a ring at the front for its head to sit on, and this makes the front heavier. I will have to add a counter-weight at the back; luckily Owen added hooks at the back to tie things to. What would I wear with the oss? I buy green material and make a tunic and cover this tunic with leaves for a bogie/fool outfit, an accompaniment for the horse, I want follow it with bells, a mask, and a jesters’ hat. Oct – To make a skirt, I want green material. Terri brings around a variety of left over green material she has accumulated. We cut up squares and rectangles and sew them together making the width of the skirt 6 metres, a little bit over the circumference of the ring. It became a patchwork skirt that had a length of under a metre. It seemed like it took no time at all. My friend Rose comes around and we bind the ring with scrap panne velvet to soften its edges. Then we measure a calico ‘petticoat’ to go underneath the cover. I cut out the calico and sewed another strip of calico to that and then I had to get another person to hold the ring as I sewed the calico to it. We also cut out the brocade that I wanted the oss to wear – a red and gold colour. I pin the green skirt to the brocade, gathering it every now and then. It is working! I sew the skirt to the brocade. Painted flags are arriving in the mail from friends – one with a corn dolly attached, one with a boat scene from the Bayeux Tapestry, and one of the Celtic Cross symbol, representing the six symbols from Susan Coopers books, ‘The Dark is Rising Sequence’. I attach bells to the bottom of each flag. One flag was saved for listing the makers of the oss and the names of those who contributed to it, so all could see how much effort was put in. I have acquired spare braid to attach the flags to. They all fit on the right length of braid and then I pin them into position. Then I sew the flags on, and then eventually sew the flags and braid onto the edge of the skirt. in all styles and sizes, dragon-like, donkey-like, cow-like. I sew on the head to the smaller ring and add a jester collar of triangles. I make a tail out of scrap material – mostly satin scraps, which will fray but I don’t mind it looking messy. I cut a hole into the brocade at the tail end of the oss and pushed through strips to tie to the hook under the calico. For more counter-weight, I added by the tail, my two garden ornament-hanging gargoyles, the Belcher and the Friar, replicas of the outer wall gargoyles of the Brasenose College in Oxford. The oss is virtually done, except for additional pieces of decoration and the straps that are to hold the oss up on the shoulders of the rider. I buy enough length for straps and when Terri and I attached it, it does not look very strong. We prepare ourselves for possible breakage. 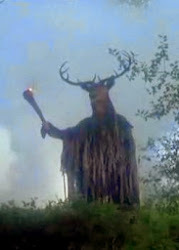 However, this Beltane gathering was only one weekend, if we are not happy with anything, we can make it better later on. I find a colour picture of the Mari Llwyd, a midwinter Welsh hobby horse with a real horse skull, and I add it to an oval frame to attach to the skirt. It looked very feminine, yet very eerie, kind of my Obby Oss' counterpart! Beltane weekend – On the Saturday of Beltane, Linda asked if the horse could be in ritual. 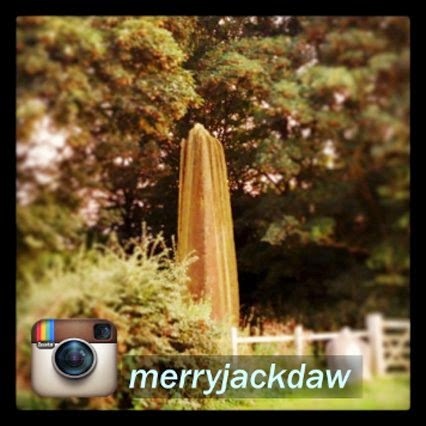 I personally wanted it to be used around the maypole on Sunday, but was prepared for Linda to ask this. Terri and I added shoulder pads to the straps and added small decorations and toys to the skirt. 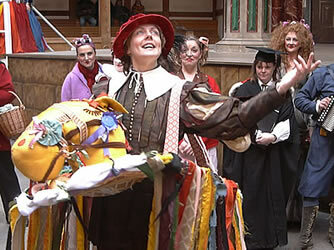 I then had to gather people for the jester/teasing job. I had my green tunic with leaves, jester hat and ivy mask, Terri was Maid Marion, Hania, Elvanna, Wendy and Emily were jesters and teaser maidens of their own kind, and Wendy’s brother Ash, was the Man-Woman, complete with purple dress and make-up. Lorena led the procession with her daughter Brielle, and they carried a ribboned wreath with bells on a stick. And most important of all, Ryan Trahar was our masked Oss rider. During the ritual the oss was called in. We all went as teasers and jesters, but made sure that Ryan was alright with his straps. It all happened so quickly, and I barely remember any of it, my main concern was Ryan and the Oss, but he indicated when he was ready to leave. The overall reaction to the oss was positive. Everyone loved him, I thought the colours worked extremely well together and the painted flags added to the community effort. Some damage was done to the oss after the rite – such dramatic festival pieces should expect a bit of battering – but I plan to make great changes to the oss in the near future, so it will be ready for other festivals. In 2006, one year after the making of version 1.0 of Dobbin, I came back with new ideas. 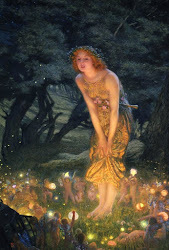 I had just spent our winter in England (their summer) and saw all sorts of pagan festivals while I was there, especially the Pagan Pride March in London (held on my birthday!) which had drummers, bogies, Giants, and a Jack-in-the-Green. Such inspiration! The Oss was far too heavy with his metal ring so we abandoned it for a cane ring. Terri made a fish shaped cane frame which was much lighter, and I took the skirt off the oss. I cut the red and gold brocade to shape and re-gathered the skirt, sewing it back on. As it was a smaller Oss, I chose the best flags to leave onto the braid and sewed that on. I then attached the head with wire this time, and re-attached the tail. All of it was much the same, not as much work was done to this one. The straps were better and the Oss was overall lighter and bounced around a lot better than before. At the 2006 Mount Franklin Beltane, we all celebrated the 25th Anniversary of the gathering. There were well over one dozen ritualists this year, as we performed a small play and sang a song during ritual. Before the circle was opened, the Oss rider ran around the circle, and our friend Steve was 'Punch' – who had two halves of coconuts and followed the rider – but the rider, in his nervousness, ran too fast and the punch could not keep up!! Dobbin certainly was better this year, lighter and easier to handle. 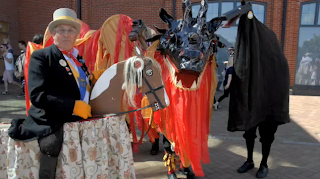 Dobbin has been used since 2006 at Beltane, but not every year. He quite often comes to Beltane to enjoy the fun, but not always get used. With luck, he will be around for a very long time! !